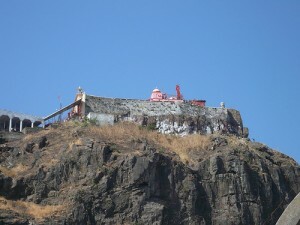 Pavagadh hill is sacred due to Godeess Mahakali, generally known as Kalika Mata, residing on its highest peak. Village Champaner at the foot of Mount Pavagadh is about 49 kms away from Vadodara, which is connected from Mumbai and Ahmedabad by Air, Railway and Road. Thousands of pilgrims visit Pavagadh every year. 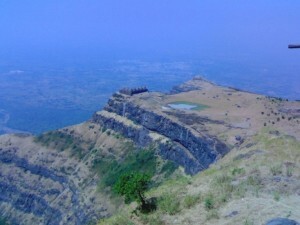 Pavagadh hill, which is 2,500 feet high, covers about 42 Sq kms. The distance from the foot of the hill to the Kalika Mata’s temple on its highest peak is about 5 kms. On a small peak of the mountain there is a temple of Bhadrakali Mata whose idol resembles that of Kalika. There is the image of Kalika Mata in the centre of the temple. It is not a full image, but only the mukhwato or the head of the Goddess with the face painted in red colour with large eyes. On the left on the same platform is a full idol of Mahakali and at the right, the yantra engraved on marble is kept before the image of Kalika Mata and worshiped. Mangala Arti is performed at the temple in the early morning after ceremonial worship. At noon, Naivedya is offered to the goddess. Sandhya Arti is performed in the evening. The Udan Khatola – cable car makes the climb very easy and fast and a ride in the cable car gives a thrilling experience. This entry was posted in Gujarat, Pavagadh and tagged Hill, Kalika Mata Temple. Bookmark the permalink.